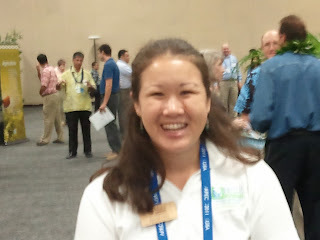 I had to navigate a number of processes to get a press pass and then to discover how to pick up my various press badges. There was no central clearing spot to discover which events were being added to the schedule. At the conference progressed, physical barriers went up and the areas where the press could go decreased. APEC Shuttles are available for delegates, staff and media to go between the numerous events at the different Waikiki hotels sponsoring APEC events. There are at least three law enforcement divisions within the Honolulu Police Department and three federal law enforcement agencies, each with their own attitudes and approaches to dealing with civilians. As an older person with some street experience I felt an obligation to make sure the protesters were okay. After the APEC Events I covered the Occupy Events, sometimes not getting home till after midnight. The camps are under the continual eye of cameras, are monitored by undercover police, face waves of police arriving in packs from the three different police units each with their own way of doing things. In addition, like the mainland, the peaceful groups have to deal with agent provocateurs infiltrating them. Most police are very nice but a few seem to be trying to provoke the demonstrators so they can get some use out of all of the non-lethal weapons they bought. The arrests at Thomas Square were not accurately reported in mainstream media outlets. 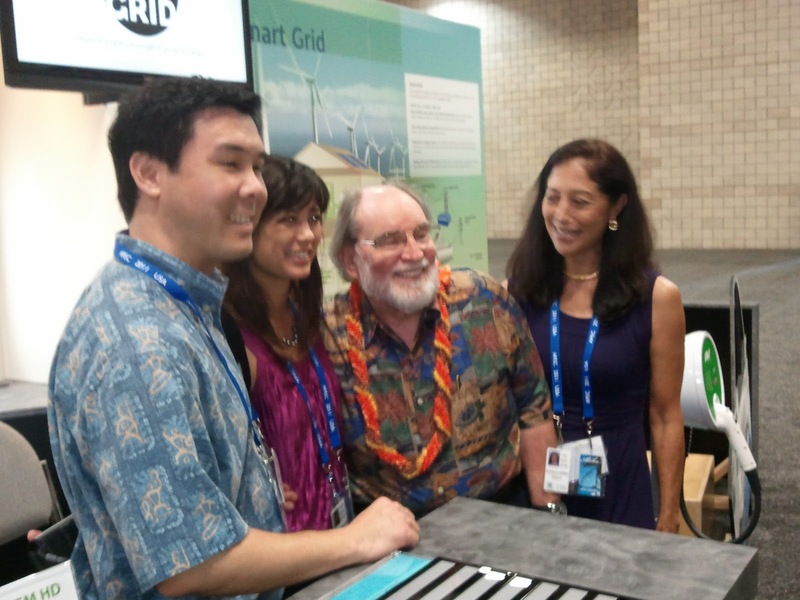 Back inside, I talked with, photographed and/or interviewed a number of people at APEC events including Hawai`i Governor Neil Abercrombie, Kauai Mayor Bernard Carvalho, Jr., Hawai`i Mayor William (Billy) Kenoi, Honolulu Mayor Peter Carlisle, Congresswoman Mazie Hirono, Congresswoman Colleen Hanabusa, Jenna King (Pacific Biodiesel) and many more. My previous articles on the APEC Conference were Uber Security, Civil Rights & APEC, APEC focuses on Big Brother/Big Government Partnerships exploiting land, sea, seabed and outer space resources, APEC: Where's labor?, Two Competing Views of the Future: APEC & Global Capitalism v. Faith &Justice, Public Private Partnership Doublespeak: The Pacific Basin Economic Council (PBEC) and the East-West Center (EWC) are sponsoring meetings at the Marriott today and tomorrow. I had to navigate a number of processes to get a press pass which required my getting State Department clearance. 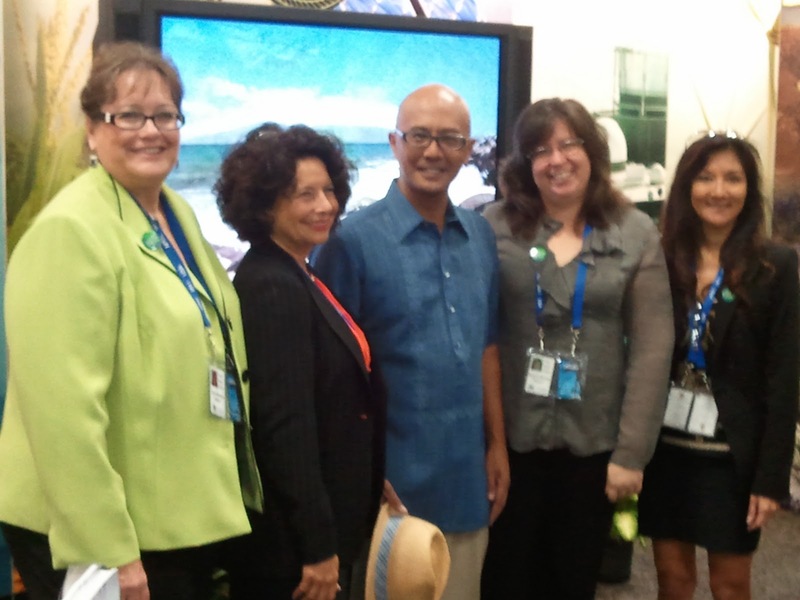 I had to learn iPhoto to crop my picture to match State Department photo submittal criteria. APEC press passes were given for the media work that I do: blogging, video blogging and directing and producing `Olelo Community TV productions. To get approved for the APEC CEO Summit, I had to first be approved for the general press pass and then apply by email to request the second press pass. To pick up the various press badges meant going to different places on different days at different times. My press passes were located at the Ilikai, the Sheraton and the Marriott. I found out that Mrs. Clinton would speak at the East West Center. I figured out how to get on the press list but applied too late and only made the waiting list. Oh well, I will hear DBEDT Director Richard Lim instead. The press can go to Hickam Air Force Base to see the arrival of foreign dignitaries. This required my filing out a separate form for each country even if the dignitaries are arriving at the same time. The forms require the unique identification number on my press pass and another unique number such as on a passport or driver license. 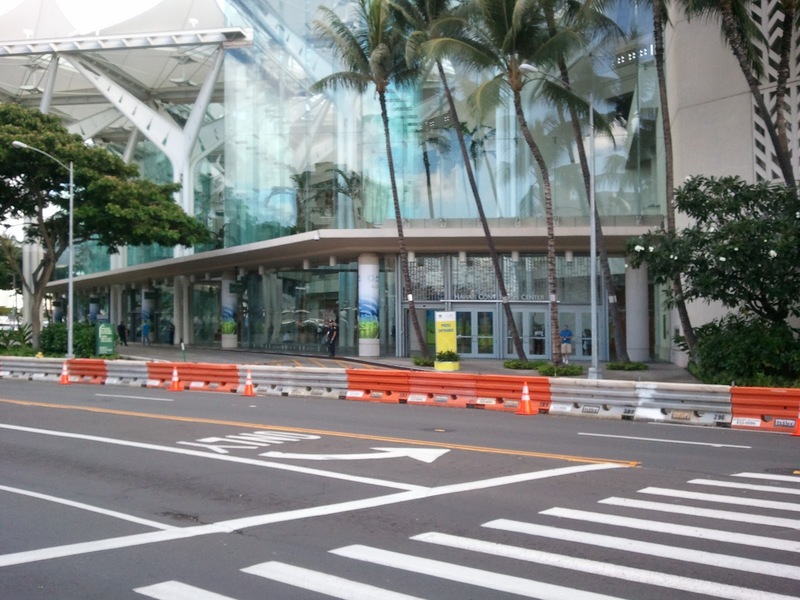 To leave the Hawaii Convention Center to get a sandwich across the street requires walking a quarter of a mile there, and another quarter of a mile back. As a result, businesses directly across the street from the Convention Center did not appear to be getting much business from attendees. Part of it makes sense and part of it just seems to be the way the cookie crumbles when multiple agencies try to sort out jurisdiction while keeping secret when different significant people will be moving through various areas. There are shuttles operating between five key points within Waikiki. The shuttles are large buses owned by Roberts Hawaii and Polynesian Adventure Tours. 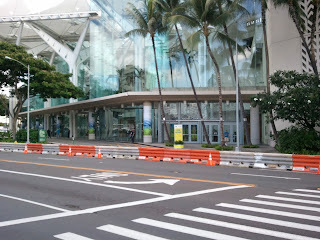 To take an APEC shuttle from the Sheraton to the Marriott requires taking one bus to the Hawai`i Convention Center, then getting on another bus to the Marriott. There is no more than a 5 minute wait for any bus. Part of the multiple layering of access seems to be by design, to make it difficult for someone on the outside to take advantage of a situation. Inside the APEC barriers virtually everybody is friendly, although some State Department personnel are a little bit less friendly. I talked with, photographed and/or interviewed a number of people at APEC events including Hawai`i Governor Neil Abercrombie, Kauai Mayor Bernard Carvalho, Jr., Hawai`i Mayor William (Billy) Kenoi, Honolulu Mayor Peter Carlisle, Congresswoman Mazie Hirono, Congresswoman Colleen Hanabusa, Jenna King (Pacific Biodiesel) and many more. There are several federal law enforcement agencies securing APEC sites including the FBI, the U.S. Secret Service, and the State Department's Bureau of Diplomatic Security. CivilBeat (November 8, 2011) quoted Frank Montoya, special agent in charge of the FBI's Honolulu Division: "I think one of the very first things that we are very careful to do is that we are very careful to protect the First Amendment rights of every person on this island, every American, to be able to express their opinions, to protest freely without having to worry about someone watching." That statement is absurd. Special real-time cameras have been installed all over the place. 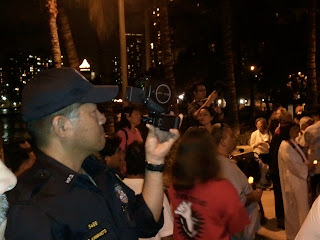 Several policemen used hand-held cameras and video cameras to film religious leaders and religious worshippers at the Faith Action for Community Equity (FACE) - Interfaith Alliance Hawaii (IFAH) gathering in Waikiki. Law enforcement agencies are filming everything. The only violence has been by a State Department special agent who murdered a young Hawaiian man. The State Department person has been released from jail and may be armed and may have left the State. In addition to covering events inside the barrier, I have been covering the events on the outside. Sometimes I don’t get home until after midnight. There are two occupations on Oahu. 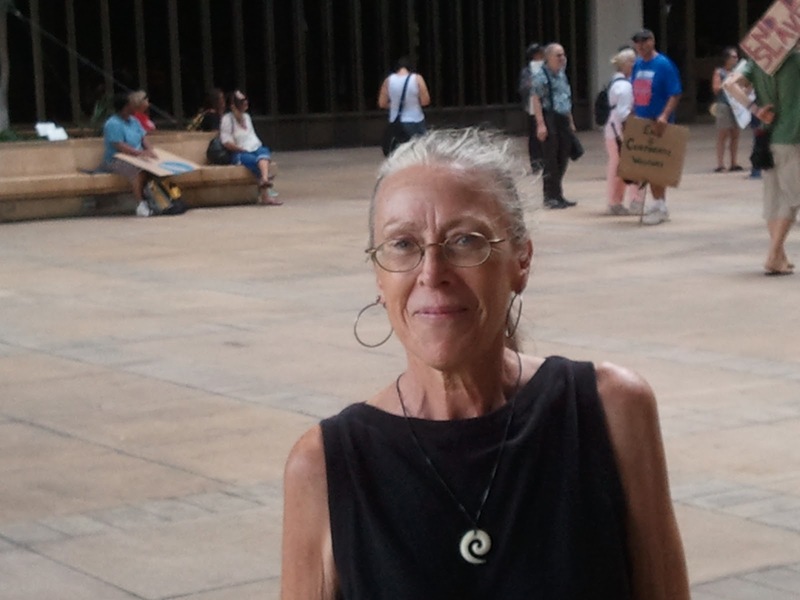 One is Occupy Honolulu which is located at Thomas Square and the other is organized by Laulani Teale at the Gandhi Statute near the Honolulu Zoo. Members of each group have shown up at the other site to show support. Each are under the watchful gaze of surveillance cameras. The cameras were set up to monitor traffic but are aimed directly at them. I filmed the camera at Thomas Square and when I looked away it shifted to monitoring traffic. 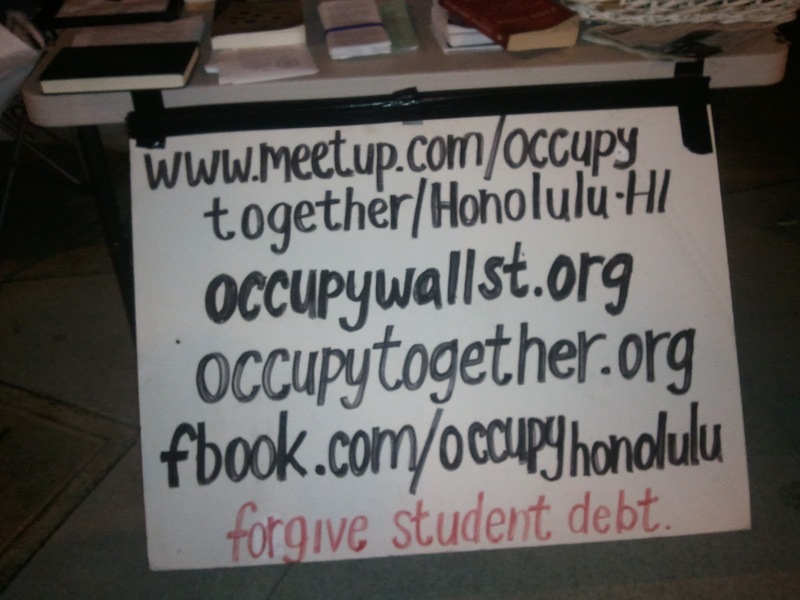 Occupy Honolulu asserts their opposition to the Asia-Pacific Economic Cooperation (APEC) meetings and corporate-centered policies. They have email and web addresses. Both sites are under surveillance of unmarked police cars that sit on the side of the road, and by unmarked police cars that canvass the area. These cars are often easy to identify. The vehicles are dark, they drive slow, have blacked out windows and they have other characteristics which mark them as the police. So much for being undercover. The Honolulu Police Department has a Civil Affairs Division consisting of policeman in aloha shirts over bullet-proof shirts. Police armbands identifying them as police are worn. The members of this group are outgoing, polite, friendly, interactive and present a very positive image for the department. Perhaps, after APEC is over, the HPD will consider transferring large numbers of traditional policemen into this unit. This move would require sensitivity training for those who want to join this community team. Both sites get periodic visits by large numbers of police cars and/or policeman on bicycles and/or policemen on foot. They converge in waves on the sites. Some are the strong silent type, some play good cop/bad cop roles, and some are very friendly. 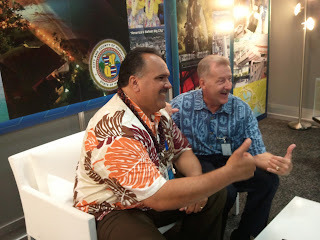 I have found that speaking in a positive friendly way with Aloha will often get a friendly dialogue going, and some will smile. For the most part each wave pretends that it is unaware of any other wave and unaware of any understandings that have been reached. Each group asks the same questions: Who are you? What group are you with? Are you from here? How long do you plan of staying? Who is your leader? What is your phone number? 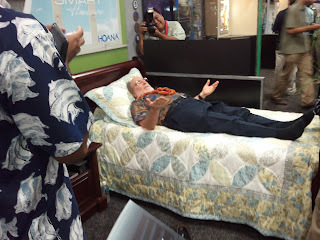 When are you going home [leaving Hawai`i]? What does that sign mean? You are using too many words on your sign. And to us: Are you with them? The police strategy is apparently ambiguity. Every wave comes and says something different, as if to entrap the occupiers who might rely on the previous wave’s statement. 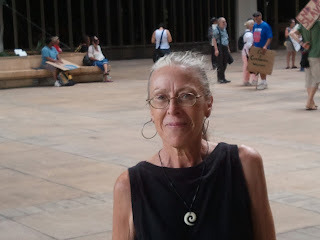 It seems that one goal of the police is to show that Hawai`i has been invaded by people flying in to occupy our State. 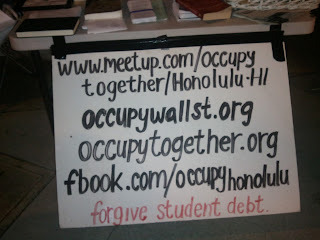 Those advocating this position seem unaware that there are Occupy actions outside of the State. Another apparent goal is to show that the occupiers are unemployed. What is obvious is that the occupiers are globalists in the sense that they are very aware of the world around themselves and are aware of what is at stake in this struggle. Many are young and are committed to making a difference. One thing that has especially disturbed me, as a strong believer in equality, it that some of the most hostile statements are coming from uniformed female police officers who are in serious need of sensitivity training. Often there is a discussion between the police and the occupiers about where protests can occur. Some police have argued that the sidewalk adjacent to Thomas Square is part of the park, and when the park curfew goes into effect at 10 pm, that means the sidewalk is also off-limits to anyone. Other police recognize the absurdity of this statement. Both camps have found areas of the sidewalk that indent into the park by a few yards. Thus they are able to set up encampments on the indented sidewalk without interfering with anyone walking down the traditional sidewalk. Eight people were handcuffed and arrested at Thomas Square. The five men were transported 2 blocks by a paddy wagon. The three women were transported in the back of a police car. Once at the police station the five men were put in one cell, while the three women were each put in a cell with another women. Two of the women were apparently put in cells with felons. There are strange allegations regarding money. In one, a policeman told an arrestee that he had to pay for a phone call, and not having money on him, could not make his phone call. Another had a $20 bill on her that was seen by the police. Her hands were handcuffed behind her back. When the handcuffs were removed the $20 bill had disappeared. Seven of the eight were released on a $100 bail and the other on a $1000 bail. The arrestees were given different court dates in December. The extent of ACLU involvement has been to educate people on freedom of speech and the freedom to assemble. The ACLU does not appear to be providing any legal representation for those who are detained. The police were monitoring the Gandhi Statute site, saw a lit candle, and arrived in a wave. Four police cars converged in the middle of the night at the Gandhi Statute to discover that the small candle had been lit to honor the person shot at McDonald’s in Waikiki. 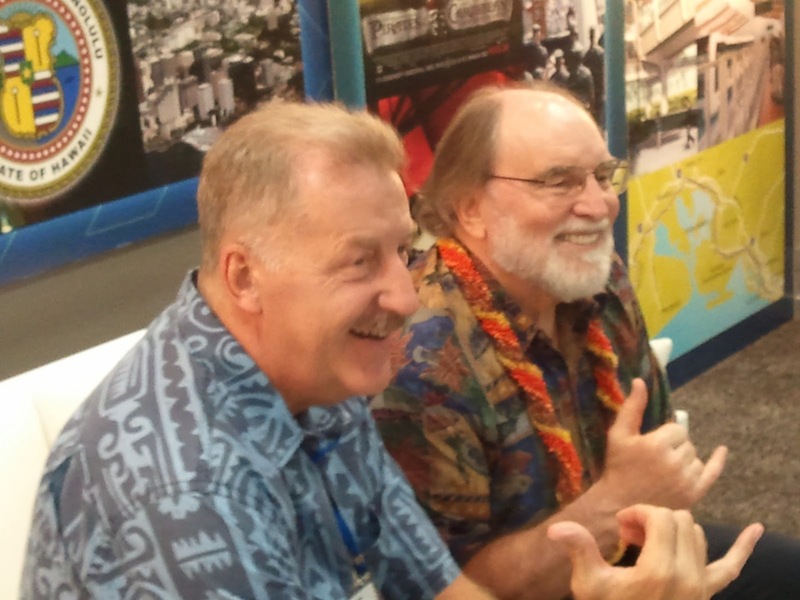 The Waikiki Group stresses the edict by King Kamehameha I known as Kanawai Mamalahoe (Law of the Splintered Paddle). This law guaranteed the right of people to camp by the side of the road. Ironically the police have a Splintered Paddle on their badges. The Waikiki group is working to educate the police about the meaning of this law. Unlike Thomas Square, the Gandhi Statute (part of the Queen Kapiolani Regional Park) has a midnight curfew. From 10:00 p.m. onwards the police stop by to let the occupiers know that there is a midnight curfew. Four of us have stopped by to witness the occupation and to report on it. One person is from Civil Beat, one is from `Olelo, and two of us have written for Disappeared News. Our presence, our cameras, video cameras, and friendly attitude has had a positive impact separate from our reporting. We and the police recognize that we are all one community. The question that I have wondered is who is calling the shots in ordering the harassment. 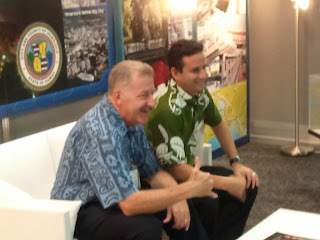 I interviewed Mayor Carlisle at the APEC meeting at the Hawaii Convention Center. Can we expect more sweeps of the homeless? We don't do sweeps of the homeless, but what I can tell you what we will do is we will continue to essentially enforce the laws of the City and County of Honolulu, as well as deal with those things that represent essentially a health hazard for other people who are around. How about the arresting of the protesters in the park at 10:00 at night? I don't know enough of the facts about that but from what I can understand some of them wanted to be arrested. I don't know if that is correct or not, that is what I was told. To make a point. The room I interviewed the Mayor in is no longer accessible by the press. 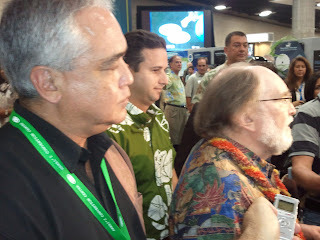 The press is limited to one room dedicated for the press located on the ground floor of the Hawaii Convention Center. Upstairs the negotiations are occurring. So Henry, are you saying that it appears the police are accepting bribes, in your discussion about the cost of a phone call and the missing $20 bill? 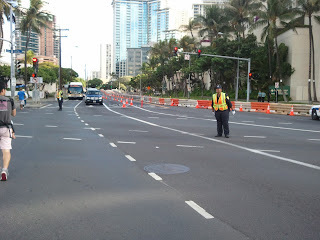 And you have not seen any Star-Advertiser or TV crews covering the protests? Thanks for the reports! Thanks for your diligence in providing us an inside view. (well, more "inside" than most of us are able to go). Didn't know there was a "Gandhi Statute"! Is that in HRS or is it international law? ; ) I HOPE it carries more authority than "the Law of the Splintered Paddle." More seriously, can you, as both a journalist and a strong advocate for transparency, get a copy of the draft Trans-Pacific Partnership agreement which is going to be signed here? My understanding is that it is a secret document and has only been shared with representatives of the large corporations and banks, but NOT with the public. If the TPP agreement is going to be the most significant tangible product of this gathering, maybe some of the elected officials who are actively boosting APEC should be asked to explain what is in it, followed up by a question on whether they have actually seen it. It is my understanding the TPP will grant even stronger support for corporate monopolies over "intellectual property," a major source of wealth in today's "information economy." Traditionally, we have thought of IP as copyrights on songs, movies, books, etc., but increasingly, it establishes ownership over food, micro-organisms, pharmaceuticals, even human DNA! We are heading deeper and deeper into a Brave New World and our (mis)leaders are hiding the truth from us while cheering us forward into the dark. Frankly, I find disgusting the smiles in your photos as our local "leaders" hobknob with out of town VIPs, grateful to be included in the partying of the global elite. They are lackeys of global capital and are selling us out in the process. Good report. APEC seems like another waste of resources. Thanks for the coverage. Even if there were nothing ominous happening, the secrecy promotes distrust, which earned or not, is why the world is in trouble. The real courage is among those who are questioning, whether those in Thomas Square, the interfaith service, and the two or three reporters who are covering the inside and outside. Have not seen any photos of hobnobbing with out of town VIPs. All are of HI people with each other. So many cameras, so much surveillance, undercover government infiltrators, enforcing laws which govern public parks to stop peaceful protest. What country is this anyway? I am going to have to use an alias to hid my identity for fear of being identified as an agent of the United States Constitution. Agent of the Constitution, LOL, Ouch!